On January 5th, 2019 Wood Roger Engineering firm came to the Nepenthe Association clubhouse for a presentation on their analysis of the water meter installations that will soon take place in the development. They thoroughly answered questions that many residents have and provided a detailed report on the existing conditions of our water systems, cost analysis, meter implementation, their recommendations and more. For those that were not able to attend the last forum, Wood Rogers will be here again on January 15th, from 7:00pm-9:00pm for another presentation. In 2016, the Board of Directors voted to request individual meters. At the time that decision was made, it was not clear what the actual physical requirements would be. In light of the potential costs and disruptions to the community, the directors had to revisit this decision. Michelle Eckerd, engineer with the City of Sacramento met with management in 2018 to discuss the installation of water meters in Nepenthe as mandated by the State of California. The City Code 13.04.305 concerning water meter installations within Common Interest Developments is enclosed in the April 2018 Board packet. Per this code, there will be certain requirements made of Nepenthe Association in order to install individual meters at each unit. Michelle attended the April 2018 Open Session meeting to provide the Board with answers to questions about these requirements and the potential costs to the Association. 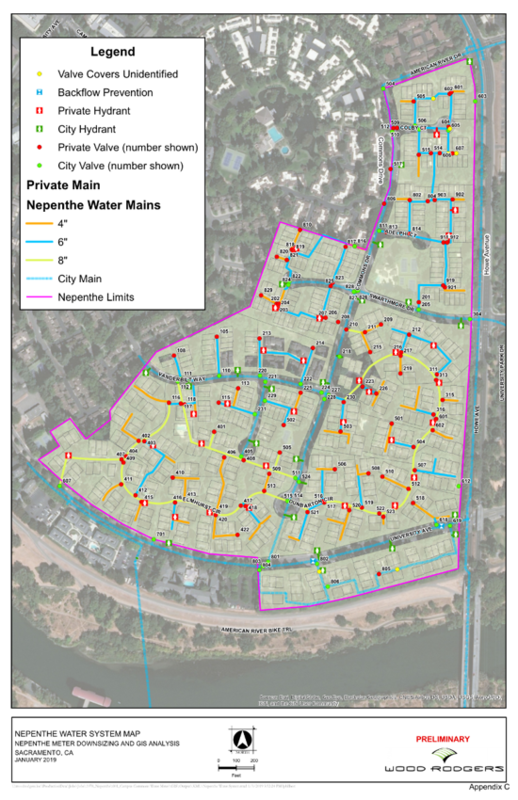 Option 1: The Board to instruct the City of Sacramento to install meters at the connection points of entry from the public water system to the private association-owned water system. The cost of water would be borne equally by the owners in their assessment payment to Nepenthe. Option 2: The Board to instruct the City of Sacramento to install individual meters at each address within Nepenthe. The association would undertake necessary pipe exposures and improvements as required by the City. The association would also record necessary easements for the utilities as required. Since then, the Board of Directors contracted with Wood Rogers Engineering firm to do a labor and cost analysis of both options. The Board felt that, although the decision had already been approved, it was the associations due diligence to ensure the proper decision was made or see if Nepenthe would need to work further with the City of Sacramento. Wood Rogers completed their inspections and provided Nepenthe with their full report of findings. Two “Water Meter Forums” with Wood Rogers (Mentioned above) held January 5th and January 15th were to answer questions that many residents have had and provide a detailed report on the existing conditions of our water systems, cost analysis, meter implementation, and their recommendations. A full re-cap of the presentation will be made available for pick up via hard copy at the Nepenthe Office.